Paris St-Germain and Manchester City have been accused of 'financial doping' by La Liga president Javier Tebas. Speaking at the Soccerex conference in Manchester, Tebas said the clubs had spent money from outside football and action should be taken to stop it. Tebas said PSG were "laughing at the system" after their world record £200m purchase of Neymar from Barcelona. He added: "We've caught them peeing in the swimming pool. Neymar peed from the diving board. We can't accept this." The head of Spanish football's top flight, continued: "It is not just about PSG but also Manchester City. I need more money from TV, otherwise Manchester City with its oil will take all these players." 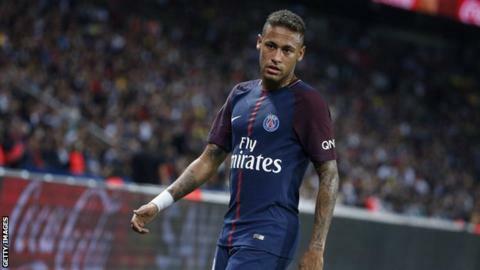 European football's governing body Uefa is investigating if PSG have broken Financial Fair Play rules but are not looking into Manchester City, despite La Liga calling for it do so. City were taken over by the Abu Dhabi United Group in 2008 while PSG have been owned by the Gulf state of Qatar, via its Qatar Sports Investments fund, since 2011. Tebas rejected any counter argument built around Real Madrid and Barcelona having been fined for receiving state aid in the past. "That's an argument my little kids would use," he added. "Why are you giving them biscuits and not me biscuits?'" Both City and PSG spent hundreds of millions of pounds on new players this summer. City's summer spend of £215m was the biggest by any club in any transfer window and included deals for England full-back Kyle Walker (£45m), Portugal midfielder Bernardo Silva (£43m), Brazilian goalkeeper Ederson Moraes (£35m) and France defender Benjamin Mendy (£52m). The Premier League club also sold several players during July and August, including Kelechi Iheanacho, Wilfried Bony and Aaron Mooy, leaving their net spend at about £130m. PSG more than doubled the world record transfer fee when they signed Neymar last month, before adding Kylian Mbappe on loan from Monaco, a deal that is expected to be made permanent for £165.7m in 2018. Tebas did not rule out Cristiano Ronaldo and Lionel Messi being targeted by PSG in the future: "Their buy out clauses are higher. But if PSG want, they can just open the gas and buy."